As a ceramic sculptor, I love the magic that comes from introducing people to clay. This is my passion and seeing other people's faces light up when they get their hands on clay makes me smile day after day. For the past fifteen years, I’ve been inspiring children through the clay classes I teach in my home studio and in many schools. I provide a simple, non-judgmental experience for all children including those with special needs. I developed “oogly” to be a character that is as different and unique as each of the children and adults using and creating. Kids of all ages love working in the 3-D medium of clay -- their honesty both empowers and inspires me to constantly look for new ideas in my own work. "The oogly kit has given me an unbelievable opportunity to spread across the planet my passion for “oogly” clay and the creative process. Working with clay has been empowering, wonderful and also frustrating at times. We are clay; we are the planet Earth. I try to tread gently upon her and not leave many scars." Myrna teaches classes to groups and in her home. Children and adults alike are touched by her talent. 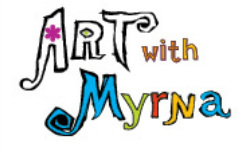 Learn more at www.artwithmyrna.com!